This comforter set is so comfy! The filling is just right - not too hot in the summer but just the right warmth in the cooler months. The colors are just as in the photos - not too bright - and work very well together. The coordinating pillows look so nice as well. It really makes the look appear "finished." This was really a bargain as it was higher priced at other retailers. I would highly recommend this! 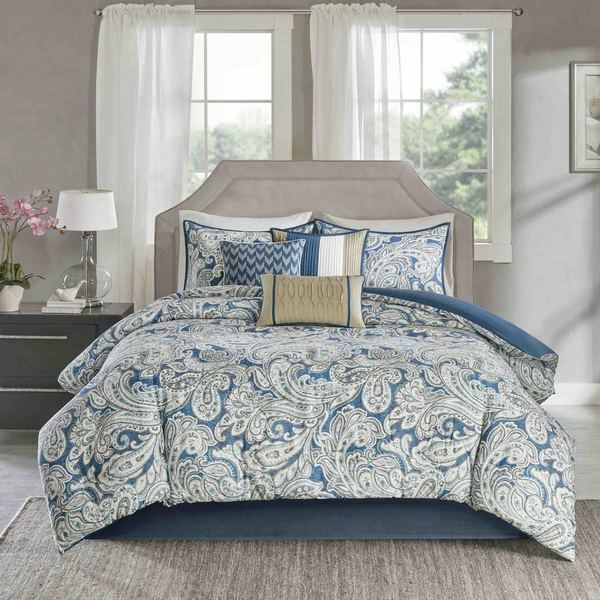 Complete your bedroom with this charming seven-piece comforter set. Featuring a classic paisley pattern in shades of blue, beige, and ivory, the set adds a touch of traditional elegance to any decor. The soft cotton fabric and plush polyester fabric ensure a cozy night's sleep, and the set is machine washable for easy cleaning. Love the colors in this bedding. I noticed that lots of other reviews said it needed a few more inches on the sides. I ordered a king size for my queen. I haven't got it on my bed yet because we just moved. I'm hoping the king fits my queen well. My husband chose this comforter set out of 5 I selected. We are trying to have more color for Spring. It is lovely. It is a perfect weight and feels more luxurious than we anticipated. Would be even better if it were an inch longer on both sides, but otherwise fits our thick queen sized mattress well. King was too small to cover mattress on both sides. 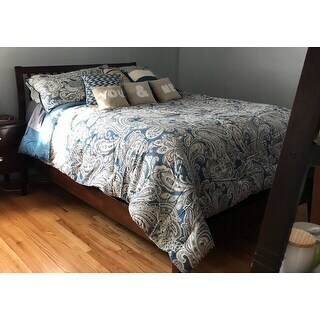 This comfortor looked much better online. The colors were great but the quality of the bedding was not what I was hoping. Although I ordered and received a "KING" size bedding set, the comfortor is very short on the sides so you see the sheets/matress separation. I can pull it down on one side but the other is way too short. This comforter would work well for a QUEEN size bed, definitely not on my KING. Unfortunately, I kept this purchase too long, trying to let it grow on me, so It's mine until I replace it. It've been so happy with so many other purchases from Overstock, but this one fell short! I will continue looking for a more desireable option. I absolutely love the print on this comforter. It looks just as good in person as it does in the pictures online. It is a thick quilt and definitely keeps you very warm. My only complaint about this comforter is the same thing other people have complained about, it’s a bit short on the side. I purchased a king comforter for my queen bed, which I’m glad I did! In this picture I have it pulled more to the side because that’s the side you see from the hallway. This is a beautiful comforter set. Price was excellent. The fabric, pillows and bedskirt are all very nice. The filling, though, is too thick and makes the comforter very stiff. Hopefully, after washing a few times, it will relax a little. The colors are beautiful. It is a thicker comforter; not ideal for where I am located but it looks amazing in my bedroom. You will definitely need to purchase a quilt to go under so that the sides of the mattress are completely covered, because it does not completely drape across the sides. Beautiful set but had to order king size to fit my queen bed. Other than that I love it. Love love love love this set!! It fit the bed perfectly. Color was exactly what was described and what I expected, so I was not disappointed. This comforter was much prettier in the picture than in real life, but the reason for 2 stars is that it was water damaged upon arrival. Disappointing. Not What I expected. The top of comforter is 100 % cotton but the other side is half polyester. Also, if you wash the comforter the stuffing will become all wrinkled up, so don't wash it. Stunning. Beautiful. Soft and cozy. Very pretty! The fabric is such nice quality, too!! Love it! !